Let’s assume wearables - and particularly smartwatches - are here to stay. How will it change things? The app has become synonymous with mobile computing. The phrase “there’s an app for that” wasn't coined for no reason. We all have our favourite apps, and everyone’s phone is customized differently. The app ecosystem has been integral to the success of the smartphone revolution. However, the app model has its critics. 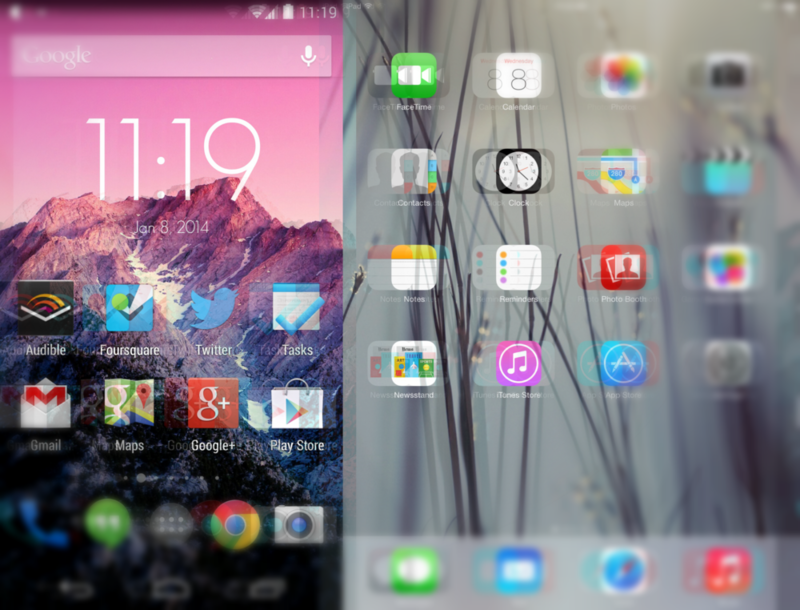 Android and iOS are very different platforms, but there is an increasing amount of overlap in their design language. The rapid user interface (UI) developments have tapered off on mobile, yet there are likely many more UI (and hardware) improvements to come. Flat Icons: CC image courtesy of Pixel Fantasy on Flickr. In A List Apart article, Jessica Enders writes about the downsides of flat UI design - something that the entire mobile industry has jumped on. Starting with Microsoft and Windows phone 7/8, Google's Holo UI, and Apple's iOS 7, the mobile world is now more devoid of texture and shadow than ever before. Enders argues that flat UI's can backfire, as they don't always provide the user with enough information. Though some decry flat user interfaces as pure fashion, or the obvious response to skeuomorphic trends, many designers have embraced the flat approach because the reduction in visual styling (such as gradients, drop shadows, and borders) creates interfaces that seem simpler and cleaner. When I say forms, I mean any interaction in which information is exchanged to receive a product or a service. This includes everything from internet banking to mobile commerce, from signing up to use a new tablet app to running a web search. Her analysis highlights many of the problems that users might experience when navigating a flat UI. She notes that the drop-shadows, gradients, and borders may not be the "useless 'embellishments'" that many "modernist" designers claim. Enders also lists three clear pitfalls of flat UI's - using Klout as her primary example. This is particularly interesting, since some of the broad goals that flat UI's try to achieve can actually violate some basic usability principles. For instance, insufficient distinction between elements could be considered an underuse of contrast. Also, a lack of hierarchy within categories is a key principle for organizing elements in Information Architecture. Enders article is quite relevant today. Check out the full piece in the source below. It's true that once you start using a high resolution display it's very difficult to revert back. Even on a small screen, text and images are so noticeably crisper that it resembles a printed page. Retina display: CC Image courtesey of Yutaka Tsutano on Flickr. In a Computer World article, Mike Elgan describes the initial reaction to iOS 7 - namely the criticisms of the color palette and design choices, and puts them in the broader context of contemporary interface design. When Apple unveiled iOS 7, some people said was a "flat" design devoid of skeuomorphism. Others said Apple copied other operating systems like Android and the Palm OS. Still others said iOS 7's bright, overly cheerful colors looked like some kind of My Little Pony theme. There's vague truth to all these claims. But the most conspicuous attribute of iOS 7 is that it's a pure creature of the super HD world. [Elgan has also written a lengthy piece dedicated to iOS 7 and Apple's new design direction]. But, as Elgan explains, high resolution screens allow designers to do more with less. Each of us has a probably unstated tolerance for how big a screen we use for desktop, laptop, tablet and phone. For example, I personally feel cramped on a 13-in. screen laptop or smaller. 15 inches is fine. 17 inches or higher is great (although too much to carry). But I didn't feel cramped on the Chromebooks' 13-in. screen. Because the screen is higher resolution than other screens, I can see the same information and detail on a smaller screen. The same goes for phones and tablets. Super high-resolution screens enable you to do more serious reading and desktop-type work on a smaller mobile device. In many regards, the emergence of these displays (which are only now becoming a standard) are, and will continue to be, the driving factor behind designing interfaces for PC's and mobile. In a Mashable article, Grace Smith interviews design guru Luke Wroblewski (former Chief Design Architect at Yahoo and founder of BagCheck). "It was clear mobile use was going to take over; designing for mobile pushed you to better and simpler designs because of constraints like small screens and slow networks; and last but not least, mobile devices had capabilities like multi-touch and location detection that allowed you to create new kinds of experiences." Wroblewski outlines five pillars of mobile design, focusing on the importance of a fast user experience, engagement with users, designing specifically for mobile, enforcing constraints, and the importance of taps. Mike Elgan talks about the concept behind Google's new card interface. Google is fully embracing the cards interface. A card is a unit of information that could contain anything but which is presented in a format for maximum surface scannability -- you should be able to know everything about that chunk of information just by looking at the card. Understanding Google's new design: It's all about cards. Windows 8: a throwback to 98?